I’m one of those women who would have been horse-crazy as a girl if my parents had allowed it. So I tentatively began learning about horses after I grew up. One of the places I started at was called Last Chance Ranch (doesn’t that sound like a great title for a romance novel?). There, Lori rescued horses from the slaughter auctions, and rehabilitated them. She taught a course in natural horsemanship, which, being a natural kind of person, appealed to me greatly. I will never forget my first “join-up” when, after chasing a horse around a round pen until he showed signs of “readiness,” I then stopped, turned around, and waited, as he willingly, on his own, walked right up to me. His name was Epic. And his voluntary association with me made my heart melt. Since then, I’ve been to dude ranches (and will never forget riding through the Wyoming forests with Garrett, head wrangler at Lost Creek Ranch), taken all sorts of lessons, and even been thrown from a horse for the first time (no injuries—his name was Peter Tosh, and we were on a Caribbean beach—later, we made up and went swimming! ), and I now have a horse-crazy daughter of my own. I don’t yet own any horses. This week, I start my new job as CEO of Rodale Inc. I’ve managed people for a long time, and always kept in mind what I’ve learned from natural horsemanship, but when I read that description, I realized just how appropriate it is for any leader or any person. No one wants to be forced to do anything or dominated or made fearful or intimidated or coerced. No one. Not a horse, not a person. I might not get much riding in these days (in fact, I went the whole summer without getting on a horse, which totally annoys me! ), but what I’ve learned from horses, I hope, will make me a better leader. I know it has made me a better rider. 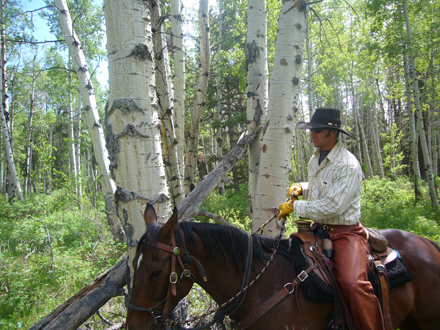 Garret, head wrangler at Lost Creek Ranch in Moose, Wyoming, spent an afternoon I will never forget teaching me his Natural Horsemanship secrets while we rode through the forests, meadows, and mountains of Wyoming. I went for a 1 hour ride at a dude ranch in the NY Adirondack Mountains last week and it was great. I hadn’t been on horseback in over a year and really missed it too. Horses are great! Never been on a horse. The first and only time I wanted to was in the Bronx, NY in the early to mid ’80’s. There is a riding place the around CIty Island and I went with my brother and others. It seens there was a horse for everybody but me, which annoyed me and I thought was quite unfair. So I never went back and never got the time or invitation again to go riding. Went to the Spanish Riding School in Austria to see the Lippezan(spelling).Magnificent!!!!!!!!!! Excellent. Horses are beautiful animals and I always admire them when in their natural setting. Yes, much can be learned from them and our association with them. Hopefully we are able to treat them with respect, unlike the way we sometimes treat our fellow humans. Please forgive my mistakes. Still haven’t found my glasses. Wonderful news, if you can ensure this philosophy is adopted by all employees at Rodale, especially those who have been given the sacrosanct responsibility of being leaders in your organization, I’m sure the whole company will benefit tremendously. I’ve had personal experience with a manager who used methods of management quite contrary to the Parelli method and it was very demoralizing to say the least. When I finally had enough and stood up for myself, I was fired (after over 20 years of dedicated service) within days. Yes I know what you mean when you had a love of horses. when i started school I would get into trouble almost every day. There was a man across from our lane who broke an trained wild horses and mules. I would go over there and just talk and pet if they were in a stall low enough. He would call my mom if he was home or mom would know if it took me to long . She then would call my dad . When dad got there I was in big trouble. Dad promised that when spring came that I could ride the old mule. Well that didn’t work very well the mule fell in the frozen pond and died . I rode a few horses later in my early twenty’s I have throned more than once almost got nocked off under low lim’s and low barn and bucked raired up on . Then when I was 24 I bought a horse named Jan they had her for there kids she pulled a lot tricks to make me think she was tired or hurt. She had a lot of things that worked. She was real good with my younger brother’s and sister’s. But not always with me. I sold her when I went to stay with sick Grandmother. I always thought that my husband would buy an acher or two. But that didn’t work out .I wanted a wild mustang . And that work out eather.I am now 57 years old worked hard all my earlyer years and now i would not be able to walk for 2 or3 weeks. May I could get a wagon and a horse before I can’t do it or leave this world. So I am so glad some one got to have horses and enjoy them. I can’t ride very well anyway. Wyoming is such a beautiful place for horseback riding. My husband and I went there only a month ago for our honeymoon, and we had a wonderful ride not too far away from Moose! It’s so different to be carried by a living, breathing thing…to lose a little bit of that control that we seem to always think we need to have over everything and give a little more of ourselves in the process. It was, for me, the best part of our honeymoon–a trip up a mountain and through fields of wildflowers. And don’t get me started on the views! Breathtaking!! I have horses. I used to show a lot. Now I just trail ride once in awhile. Going to my barn is the best part of my day. I forget the outside world and enjoy these mystic creature. My newfoundland dog goes with me and I think he knows that horses are a special gift from God. I believe what Pat Perrila says. Working with horses and dogs teaches you alot of things if you will just listen. and buying a horse of my own while knowing almost nothing about them? I love all animals and am always concerned for their welfare. I can’t stand to see those little ponies at the fair that are forced to walk in a circle for who knows how long, and especially can’t stand to see carriage horses, either. I love your blog! Keep up the good and sometimes controversial work. I also have been around horses for a great deal of my life and am a big fan of Parelli’s work. I wanted to add, from my own experience, both horses and people flourish with clear but sensitively communicated boundaries and directions.